The décor is tropical and fun throughout the spacious condo! Imagine yourself floating around the lazy river and then make it happen. Heron 609 has been furnished down to the smallest detail for your vacation experience. 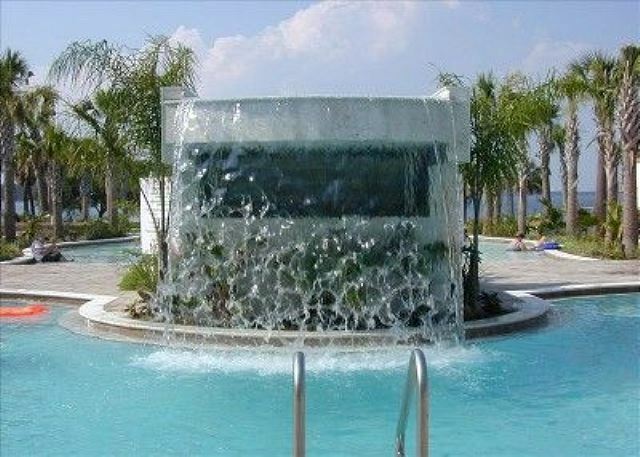 This 3 bedroom 2 bath condominium is a large end unit (1974 sq. ft. total area) with extra windows. The wrap around terrace is very large and roomy for evening meals or coffee in the morning as you overlook the unobstructed views of the bay, lazy river, and Gulf of Mexico. We recently furnished the balcony with new comfortable lounge furniture that seats several for your comfort. You can see the bay, lazy river, or gulf side from every window. We really loved that about Heron 609! Beautiful tropical décor including new Hunter ceiling fans throughout the condo, paint, draperies, rugs and furniture. We have added a beautiful sleeper sofa and sleeper chair, and huge Panama Jack entertainment center with flat screen 50” television and Sony blue ray player. Gourmet kitchen has granite counter tops and upgraded stainless steel appliances. Kitchen is equipped with everything down to new paint and decor! Great cookware, dishes, and every kitchen gadget you can imagine. 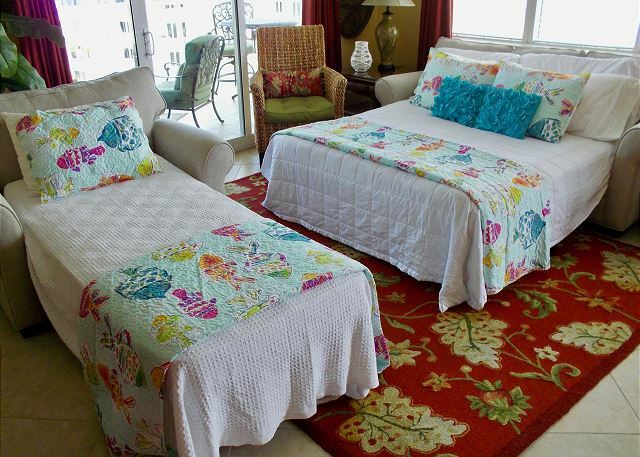 Master bedroom has beautiful new tropical décor and furnishings. You will sleep well on the pillow top Sealy Posturepedic mattress with Ralph Lauren bedding. Ensuite private bath has large Jacuzzi tub, separate travertine shower and double vanities. Large walk in closet. Terrace access from the master bedroom. We want to make sure you have a good nights sleep and feel surrounded by comfort while staying in our condo. This unit has two Master Bedrooms for the couple who vacations with friends or family. Second bedroom has beautiful tropical décor and a king pillow top Sealy Posturepedic mattress with Ralph Lauren bedding for your comfort. Flat screen television with Sony blue ray player to watch movies. Beautiful waterfront bay and gulf views from this suite. Bedroom three has it’s own private balcony with a beautiful view of the gulf and bay, new flooring, fresh paint, ceiling fan, and bright décor that just makes a person happy! The third bedroom has bunk beds with full on bottom and twin on top with an extra pullout twin underneath. Sleeps 4 and great room for the kids. We also added a new armoire for the flat screen television and Sony blue ray player. *High speed wireless internet and cable television provided during your stay. *Private pool for Heron residents and guests only. *Bayside-700 ft. 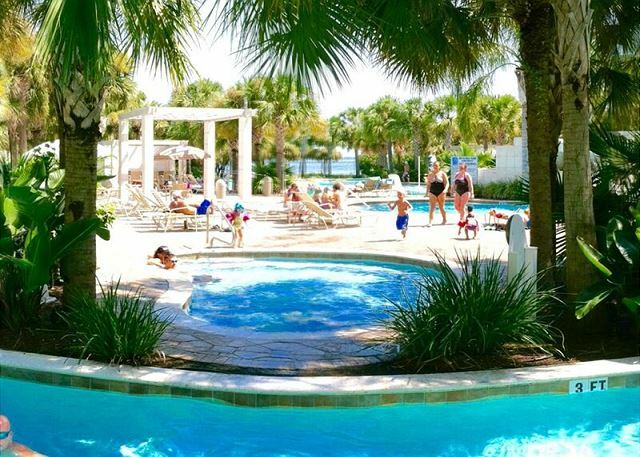 Tropical Oasis Lazy River with gradual decline pool entry and waterfall (floating tubes included), several Jacuzzi/hot tub areas, BBQ grilling areas, grassy play areas, wonderful walking trail around the resort. 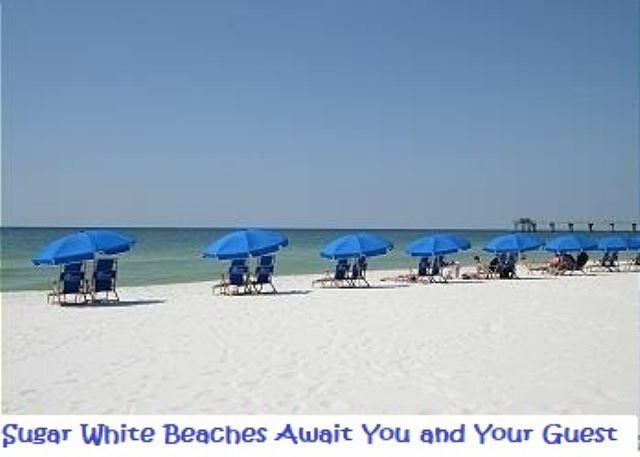 *Rental agent offers the use of beach chairs, umbrella’s, wagons, and toys for the kids for use at the beach. 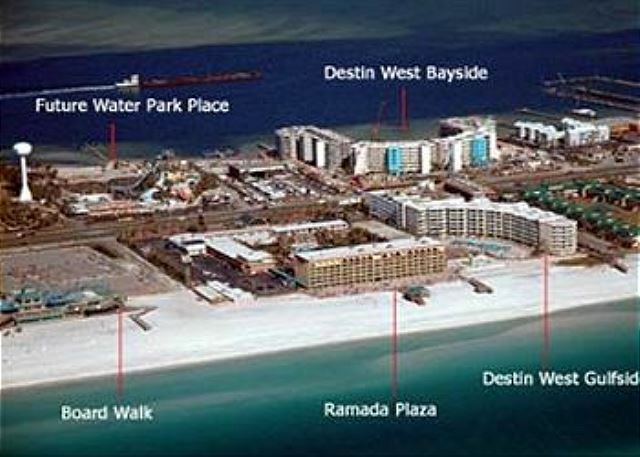 Destin West Beach and Bay Resort is located next to the Gulfarium, the Boardwalk, public fishing pier for fishing, great live music, restaurants, and the new Fudpucker’s next door where you can rent jet skis, kayaks, a barge, or go parasailing. So convenient you can park your car and walk for entertainment during your entire vacation. Great fishing, bike trails, shopping, snorkeling, diving, sailing, surfing, kite boarding. We hope you enjoy your stay. ****All reservations require a $49 property damage protection fee which covers up to $1500 in damages. Reservations made online will be billed the $49 automatically. PLEASE DO NOT PURCHASE DAMAGE INSURANCE THROUGH VRBO AT THE TIME OF BOOKING AS THIS WILL BE A DUPLICATE CHARGE. Effective 4/19/2017 any new reservations made using American Express will be charged an add'l 2.5% cc fee. 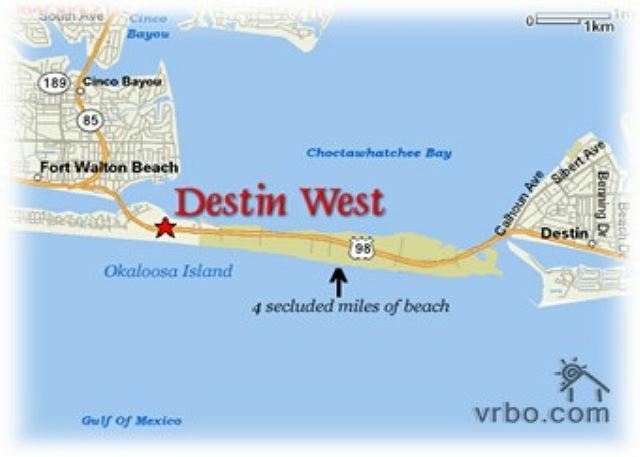 We had a wonderful time at Destin West. The heated pool made the afternoon so relaxing. Everything from check in to check out was very organized and well explained. The location of the property is convenient to all of the activities in the area. 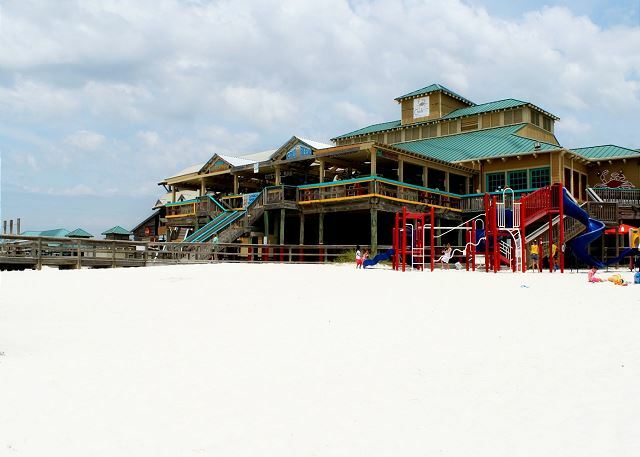 Our favorite non beach activity was the Segaway tour of Destin. I would definitely recommend this property to others. It is spacious, clean, and well equipped. Dear Ms. Hanna, Thank you for this amazing 5 star review! We truly love hearing from our guests and enjoy reading your recommendations! We'll be standing by to help you book your next visit! Dear Mr. Montgomery, We're so pleased that you enjoyed your stay in 609 Heron! Thank you for taking the time to leave us this amazing review! We'll save some Florida sunshine for your next visit! The condo was beautiful and very clean. We had a great experience and will definitely consider staying here again. Dear Ms. Iller, We're so grateful for your amazing review! We love hearing from our guests! We're always here to help you book your next trip whenever you're ready to come back! From the property managers to the condo to the resort all were 5 star. Dear Mr. Hampsey, Thank you so much for taking the time to leave this wonderful review! We're so happy that you had a good stay, and hope you'll be back to visit again soon! We had a wonderful time with our kids and grandkids. Only suggestion is that a pizza cutter was needed. Everything else needed for kitchen was there. Wonderful amenities and it was great to be able to use Ramada facilities. Ocean was not as clear in Ft. Walton as water in Destin but all in all a wonderful time with family. Dear Ms. Loveless, Thank you for taking the time to leave us such a wonderful review! I wish you had let us know about the pizza cutter so we could have brought one to you! We try to keep up with things that go missing from our units, but during the busy summer months, we may not see that one is gone. We'll be sure to add one for your next visit! We're always available to help you book your next trip! The condo was beautiful, spacious and accommodating! Great location. 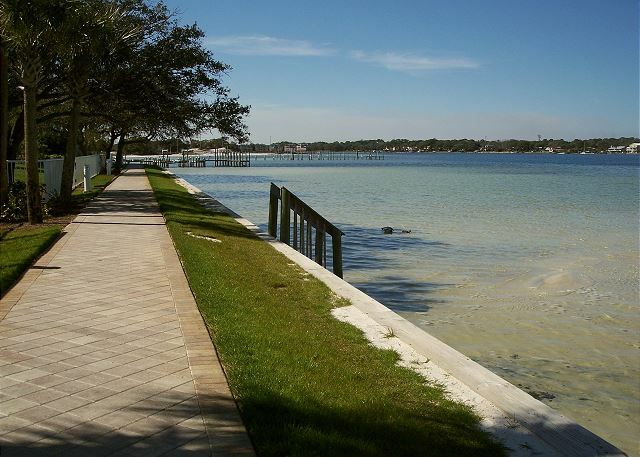 Close to beaches, restaurants and a short drive to Crab Island. The onsite management staff was very friendly and helpful. Had such a great time. Will definitely book again. Dear Mr. Ehling, Thank you for taking the time out to leave us this amazing review for 609 Heron! We love hearing from our guests and are happy to hear how much you enjoyed your stay! We'll be looking forward to your next trip! Wonderful stay, we had an issue with a/c unit leaking and I was fixed immediately😁. Everyone we dealt with were super nice and accommodating. We will definitely stay here again. Condo was beautiful and clean! I hope owners willl continue to maintain this excellence for years to come, as we will be happy to return for future vacations. Dear Ms. LeBlanc, Thank you so much for this wonderful review! We always treat issues that may arise as a priority and am so happy we got to you quickly! We're ready to help you plan your next vacation when ever you are! We had the best time. 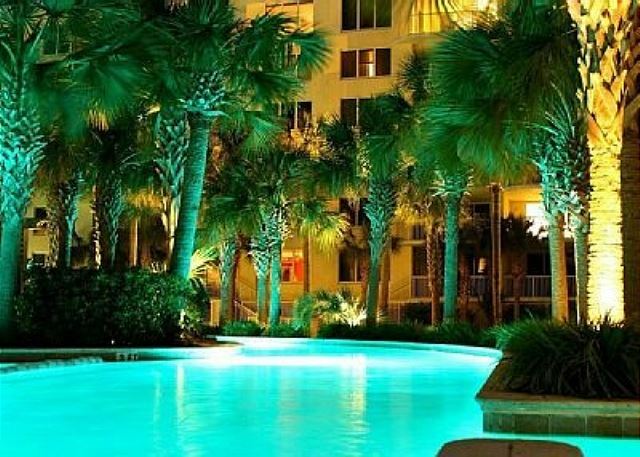 The condo was fantastic, very clean and well appointed, the resort was great with loads to do and entertain all, and management was very helpful and responsive. Can’t wait to come back. Dear Mr. Hall, Thank you so much for your positive feedback! I've shared your kind comments with the staff and we can't wait to make arrangements for your next trip! We stay in a 3 bedroom house n I'm calling that because that's how it felt. Dear Ms. Garcia, I agree! These three bedroom condos DO feel like homes, don't they? I'm so glad you enjoyed your time with us. Please come see us again! Great location, amazing management, truly a joy to stay there, highly recommend! Dear Ms. Bakalyar, I'm so happy to know that you had such a wonderful experience! Thank you for your sweet comments. Its so nice to know when we have exceeded expectations and will look forward to doing that again when you return! We had a great time on our vacation! Wonderful condo, great pools, great weather! Best vacation. We have had. Dear Ms. Rodewig, I'm so glad to hear that you had a wonderful vacation! As property managers, this is what its all about for us! We can't wait to book your next visit! The condo was beautiful. Very clean and well- maintained. No complaints whatsoever. I would definitely stay at Heron 609 again. The condo was very beautiful and we thoroughly enjoyed ourselves. Anytime we had any problems they owner and manager were very attention and took care of things quickly. We would definitely recommend staying there. We did have an issue on our part with my nephews playing music loudly from the balcony. The owner called me and politely expressed her concern and once I found out what was being done we took care of it quickly. The overall experience was very pleasant. We loved the garage with all the pool/beach items for us to use. Hi Cody! Thanks for the great review. No worries about your nephew but thank you for taking care of it so quickly. We appreciate you staying with us. We loved the Destin area and our condo as well. The property was well maintained and the inside of the condo was exactly as the pictures reflected. It was clean, had anything you would ever want or need in the kitchen and was beautifully decorated. We plan on returning for sure !! I said those exact words to myself every evening when I got back to Heron 609 after work. We could not have asked for anything more elegant, cozy and convenient. It was just absolutely amazing!! We will most definitely be returning in the near future. We took our family of 6 with older children and had a great time. Spent more time at pool than the gulf, but access to gulf was easy. Definite difference from bay side to gulf side, and you will want the bay side for nicer accommodations. Great trip for the whole family!!! Very nice unit. Was disappointed when we had to run out to buy hand soap right away. Any other unit we have rented anywhere always supplied a start package with mini bars of soap, mini shampoo and starter laundry detergent. This unit had none of those. We thoroughly enjoyed our stay in Heron 609. The room was very clean and was stocked with pretty much all the necessities, plus some. The best part of all is the view from the room. 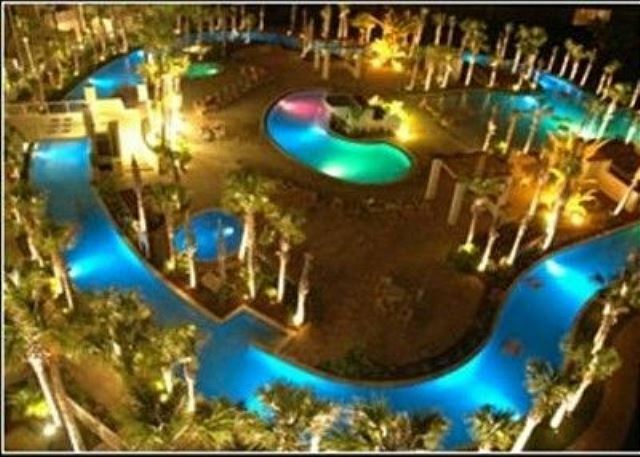 It had an excellent view of Lazy River, but you could also see the gulf from a different area of the balcony.